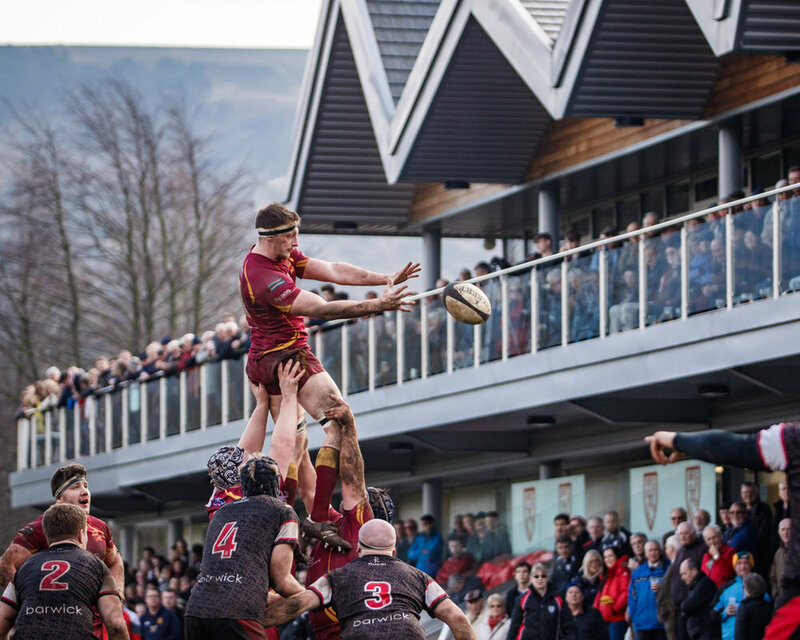 Spring was in the air once more as the sun shone down on Ilkley Rugby Club's spectacular clubhouse. On this occasion it was filled with former players, all returning for a reunion dinner and, no doubt, a few drinks. Hopes were high that the current crop could top off the day with a win. However, they were up against Sandal, a team lying several league places above them in fourth place. Given that ickledot has photographed both teams previously this season, he faced the dilemma discussed previously: which one to concentrate on this time and which end to sit at. Thankfully, the decision to take a position behind the try line Ilkley were attacking in the first half and then reassess at the break proved to be the right move. Not a classic of open attacking rugby, it was very close throughout. Both teams needed to give of their best, particularly the forwards, in order to stay in the fight. As it happened, although the play was gritty and attritional for much of the game, it ultimately turned significantly on two scores in the same corner by each team's full back. Sandal seemed to be having the better of it during the first forty when Ilkley's Ben Magee broke down the right and forced his way to the try line. It was late in the half and ickledot had moved to the twenty two metre line. Although this meant that the touch down would be missed, he grabbed some dramatic shots of Ben's run, highlighting the effort and determination in his facial expressions. It was also great to get a shot or two showing the attempts of Sandal's Josh Walker and his team mates to stop Ben touching down. Although Ben didn't score himself, he was able to lay the ball off for a score. The try brought Ilkley to within three points of Sandal, the score being 10-13 at the break. Decision time for ickledot! It was tough but, based on Sandal's higher league position and their slender lead (also a touch of laziness perhaps!) he opted to stay put, i.e. at the end Sandal would be attacking. Unlike, the game at Wharfedale a few weeks ago, the decision proved to be a good one. The second half was just as close as the first. Ilkley drew level with a penalty and for much of the half the two teams were locked on thirteen points each. Enter Sandal's number 15, Tom Coad. He'd had a number of runs previously which had amounted to nothing but this time he saw his chance and went for it, touching down in virtually the same spot as the try which his counterpart had created earlier. The long kick wasn't converted so the try ended the day's scoring, Sandal emerging victorious by 18-13. Well done to them. No consolation to Ilkley but they did play incredibly well and if quite a number of opportunities had been taken the result could have been different. It was a good afternoon photographically, topped off with a number of pleasing portraits after the final whistle. You can see more pictures on Flickr and a good number over on Instagram. ickledot's up to almost 700 followers over there now. If you're not one of them, give him a follow!